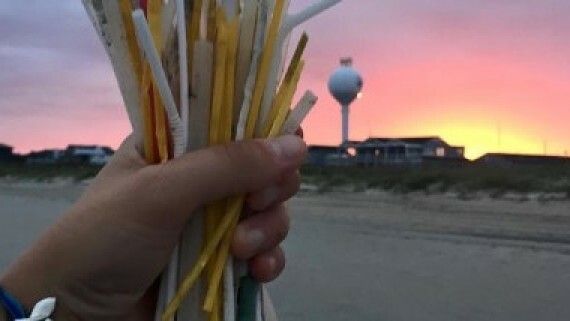 This weekend I went to a mini conference hosted by the Mid-Atlantic Marine Education Association. The conference took place at the Bald Head Island Conservancy. 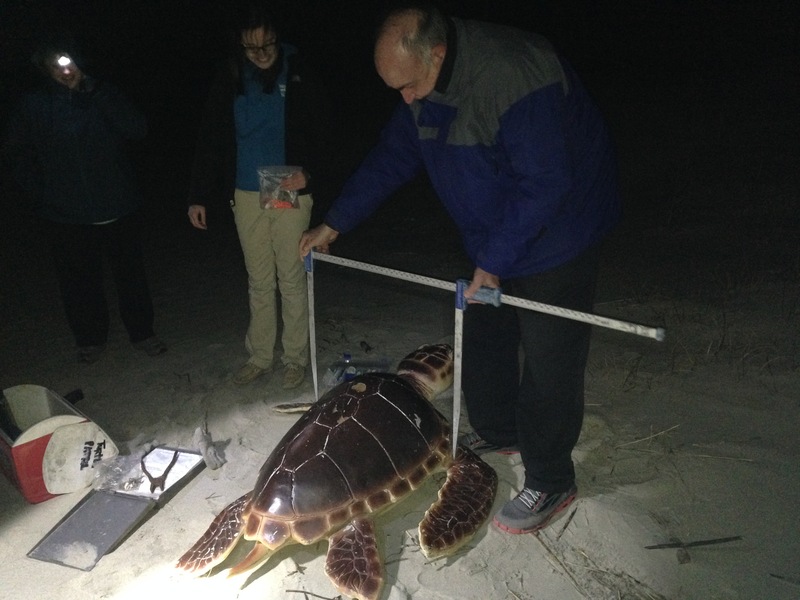 We met with marine educators from Maryland to South Carolina. During the conference we had workshops on how to control deer populations using vaccines, how to identify frog calls and even how to measure and tag a nesting sea turtle. 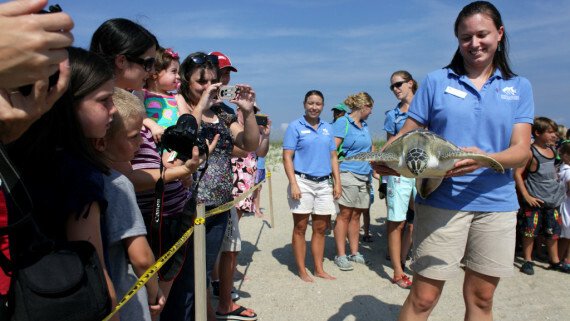 Emily, the Conservancy’s sea turtle coordinator, hosted a session all about their work on sea turtles. She taught us about their internship program and all of the education they do with the public. 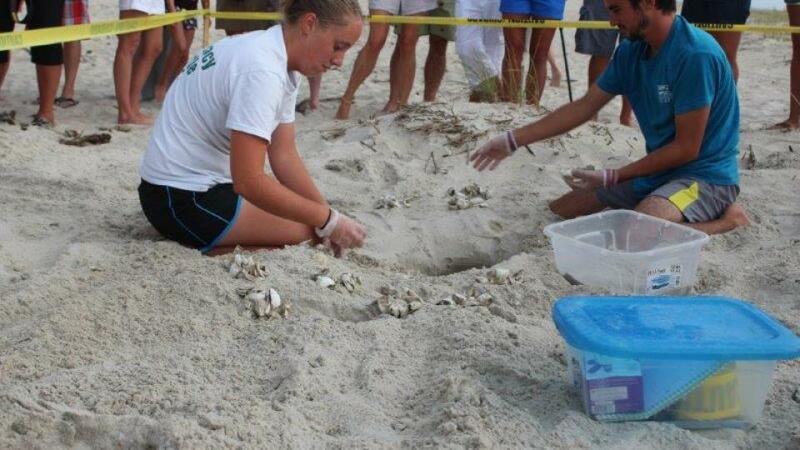 Every summer interns stay on the island to locate nesting sea turtles and protect the nests. Emily began as an intern before being asked to stay on as staff. She took us to the beach and we were trained on how they process a nesting sea turtle. Every night from April to August interns ride up and down the island on UTVs (Utility Terrain Vehicles) looking for sea turtle tracks. 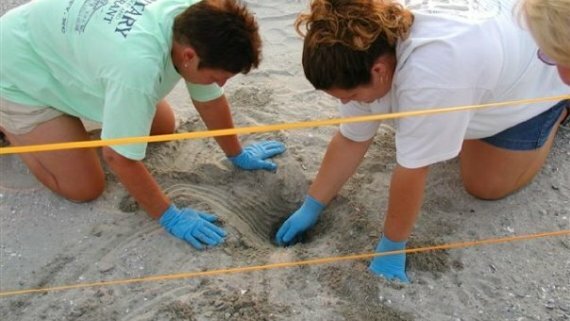 If they only find one set of tracks, it means the sea turtle is still on the beach nesting. They turn off their UTV and wait quietly to make sure they didn’t disturb the mother turtle. 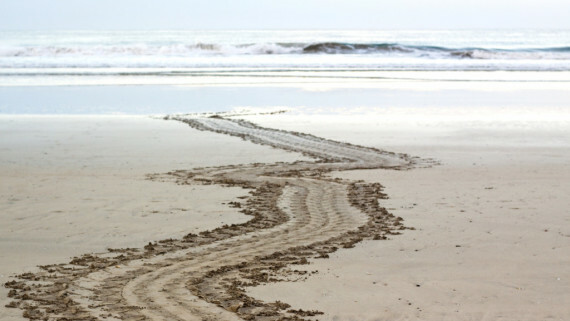 Then they quietly follow the tracks up towards the dunes looking for the turtle. If she has not started laying eggs, they wait quietly until she does. 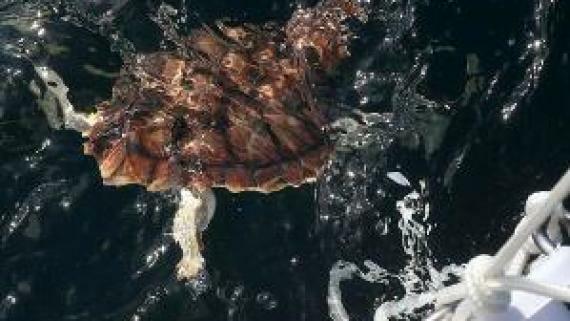 Once she begins laying her eggs, the female turtle goes into a trancelike state and is harder to disturb. 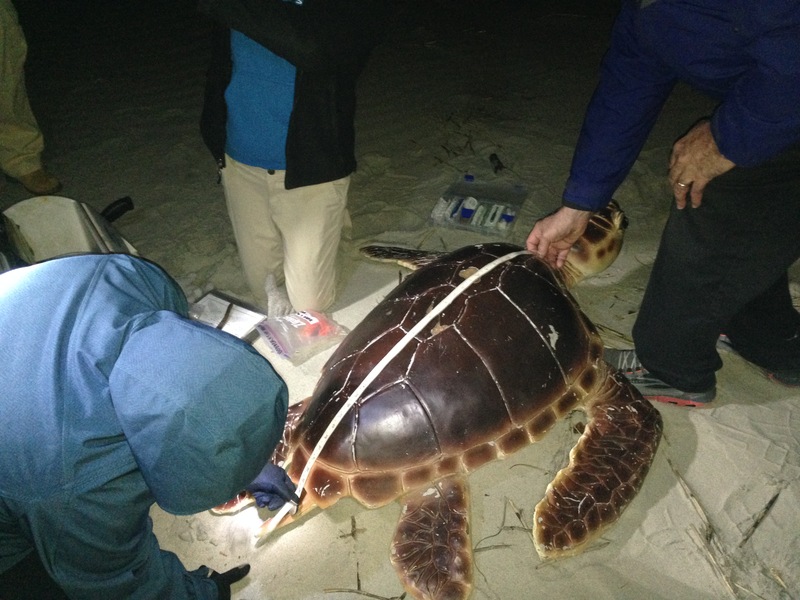 If the turtle does not have a pit tag or a clamp tag (which we’ll see in a moment), the intern must tag the turtle. 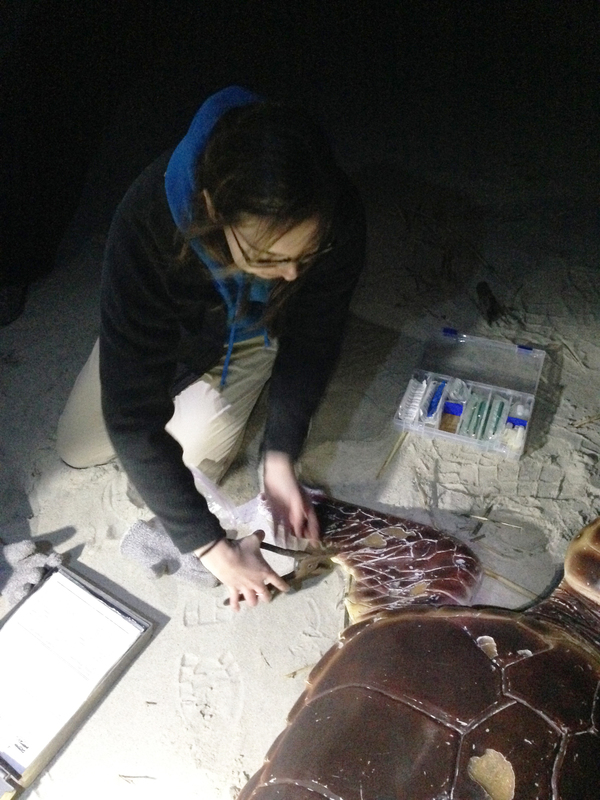 The pit tag number is recorded on their clip board and then the pit tag is injected into the left front flipper. This is the standard location for turtle pit tags. Emily points out where pit tags should be located. Once the pit tag is in, the intern clips on a metal flipper tag. 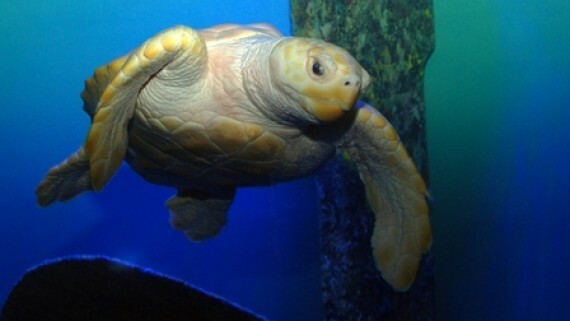 This is usually attached to the same flipper but on the side closest to the shell. Emily shows us where to attach a flipper tag. 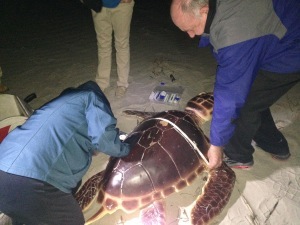 Since the female is here, the intern then takes a DNA sample from the rear flipper. If the turtle nested and left, the intern would take an egg from the nest instead. The DNA is used in a special research project. You can learn more about this project in our lesson: Are You My Mother. Volunteers measuring the curved length. Volunteers measuring the curved width. Volunteers taking the straight length. Volunteer taking the straight width. 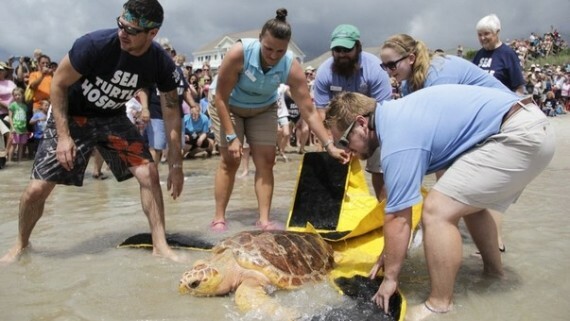 Finally, when the sea turtle begins covering up the nest, the intern drops in a bobber attached to a long orange rope and a weight. The rope will be strung out away from the nest and weighted to the ground. This helps the Conservancy find the nest again to cage it off from predators. Then they put up a sign letting people know there is a nest there. Then they wait for 60 days for the nest to hatch. 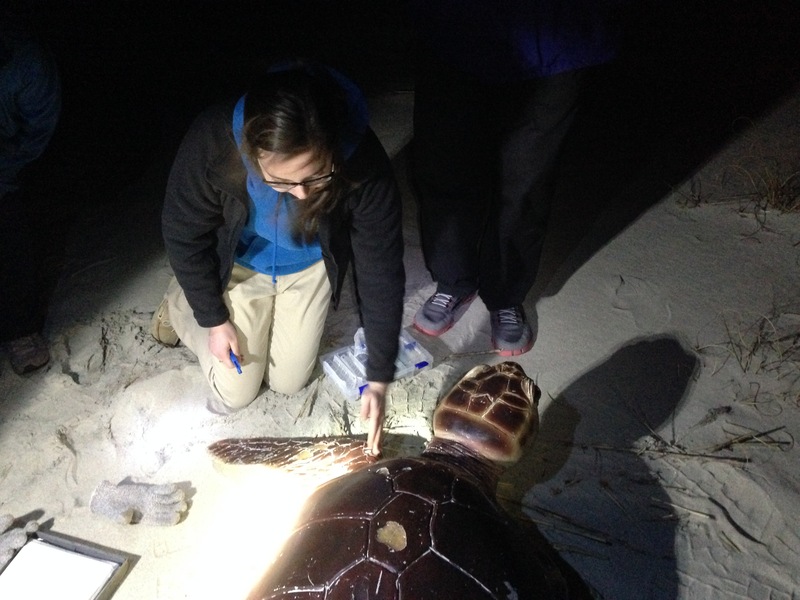 It was a lot of fun learning how to work with a nesting sea turtle. Our hatchlings are continuing to grow! This week Turtle A is 14.4 cm long and weighs 505 grams. 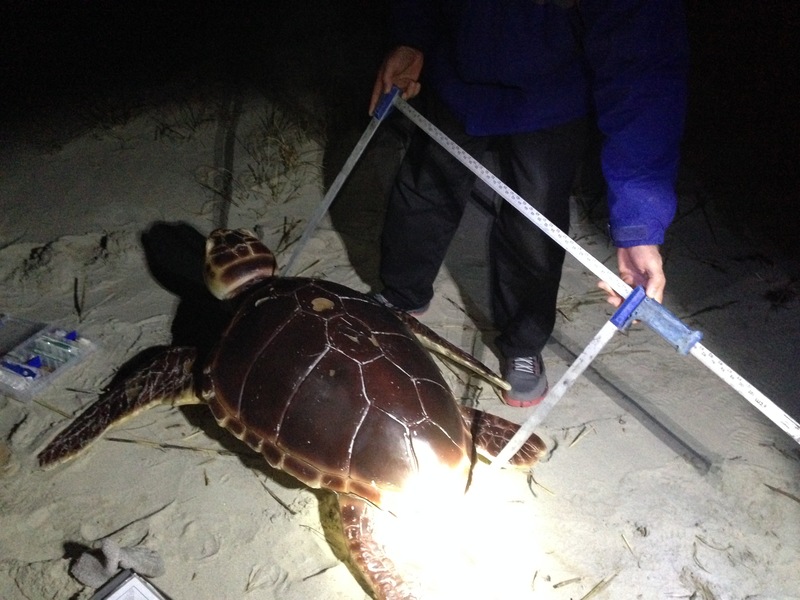 Turtle B is 15.0 cm long and weighs 575 grams. You may notice that we are no longer listing the weight to the tenth of a gram. 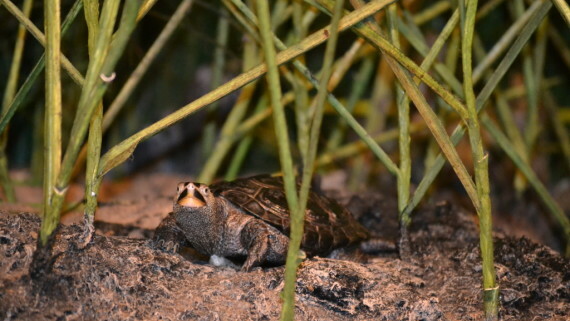 The turtles have outgrown the smaller scale and our larger scale does not measure to the tenth of a gram. For more information on what to do with those numbers, please check out our lesson: Hatchling to Yearling. We are very excited to share another activity with you this week: Bottle Cap Sea Turtles. 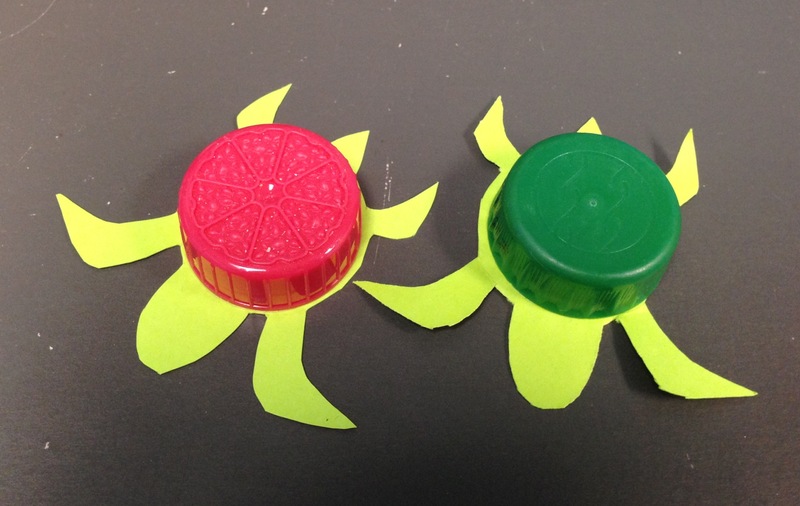 Learn about marine debris and how to recycle soda caps into mini sea turtles.